Stephanie and I will be there today along with a few others who said they would be stopping by...we would love to see everyone, the more the merrier!! Wish I cold join y'all. Have a drink for me!! Jesse you totally should stop by!! oh to be in Boston for the night... have fun! I wish I had known about this- how fun! I found your blog on Deliciously Organized. I am also a Boston blogger. 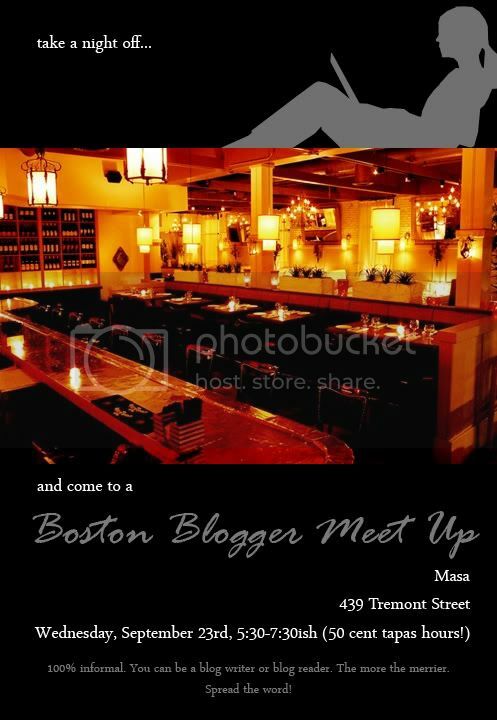 Lovely blog- I will add you to my Boston/MA blogroll. and I have a giveaway going that ends tnite!